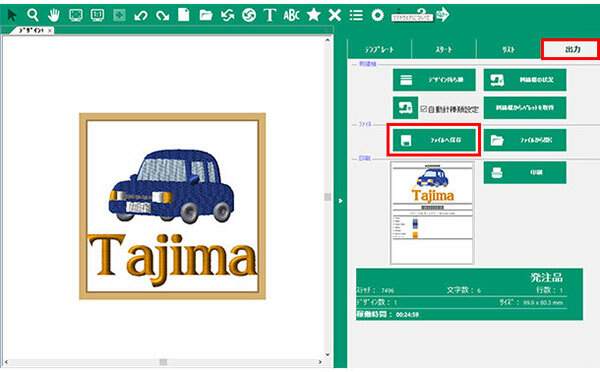 Tajima Writer PLUS converts text to embroidery data, or creates embroidery data by combining registered designs and text. Editing tasks like changing the color of embroidery threads, position adjustments etc., and thread color management in synch with the machine are also possible. 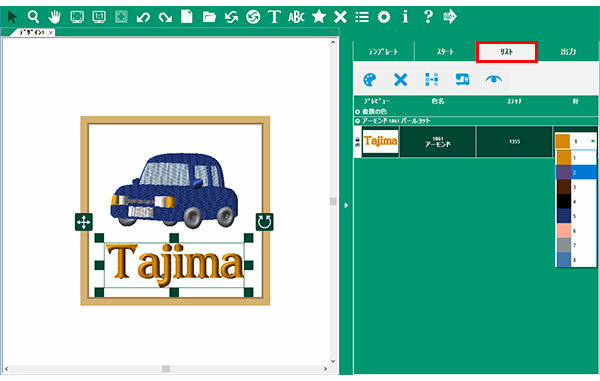 By connecting Tamija Writer PLUS and SAI via a LAN, the created embroidery data can be transmitted directly to SAI, and it can start embroidering right away. Available from the SAI Users' Site. Tajima Writer PLUS can be downloaded from the SAI Users' Site, an exclusive site for our users that have purchased a SAI. Information including an ID and password provided at the time the SAI is purchased is required in order to access the SAI Users' Site. 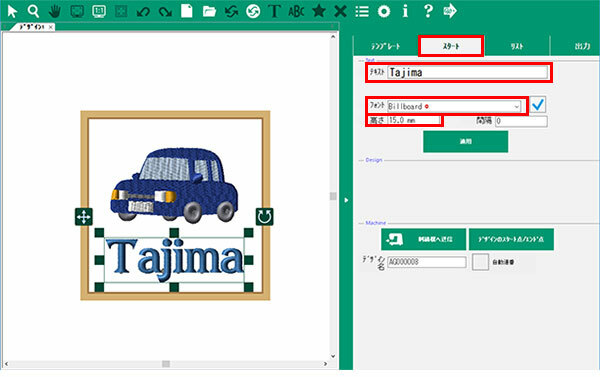 Tutorials and manuals for Tajima Writer PLUS can also be downloaded from this site. 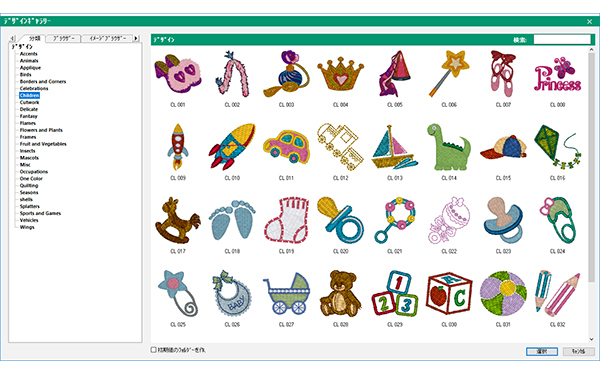 Select the desired layout from the templates. Select the desired design from the design gallery. Design size can be changed and position can be adjusted. 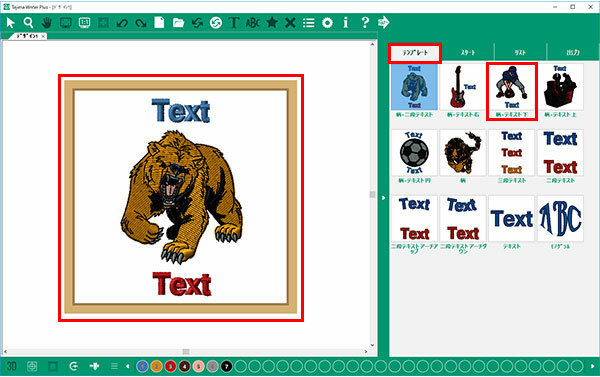 Enter the text you want to embroider, and select the font and size. An image of the text will appear on the left side of the screen. Visualize the finished product and select the colors. 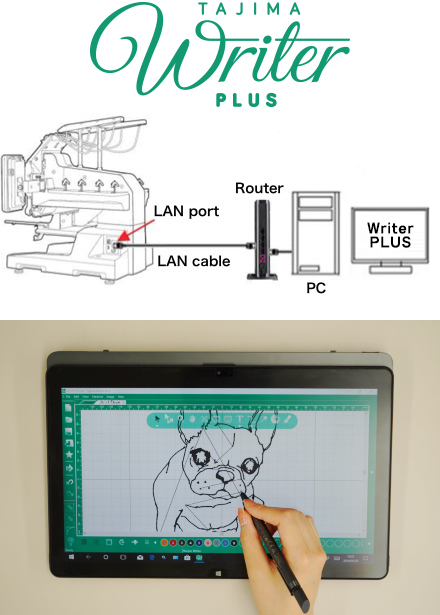 When the embroidery data is complete, transmit the data to SAI. Now, all the sewing machine has to do is read the pattern and start the embroidery. * Prior setup of the LAN connection is required.